Gmail added new themes feature to their Email interface, where you can customize your gmail account with different themes. 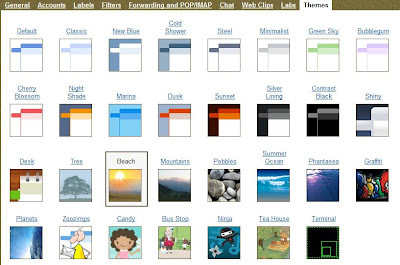 Themes also are customized automatically by your location, Gmail use the location information you provide to assign these changes with your local sunset, sunrise and/or weather. When you select one of the themes in your Settings page/Theme tab, a country/ region drop down menu will show up. Select your country/city to make this change effect with your themes collection. wow themes that change according to weather and time of day... thats cool! I should use my gmail more. I have never used gmail but the theme looks nice! Then you have to try it!